What causes Candidiasis or Candida overgrowth? What is the best treatment for Candida overgrowth or Candidiasis? What is Candidate and how does it work? What Else Can I Do to Beat Candida Overgrowth and Yeast Infections? What is the Candida Diet and how can it help me? Will the Candida Diet help me to lose weight? Candida (usually Candida albicans) is a form of fungus or yeast that is found naturally in many parts of the healthy body, especially in the digestive tract. Usually levels of Candida are controlled by microbes or other substances which co-exist in the digestive tract. However, when immune functioning is compromised, levels of Candida in the system can increase and cause health problems. Sometimes these can be mild and can include vaginal thrush and other forms of yeast infection like athlete's foot. Other times Candida overgrowth can become systemic and cause major health problems (see symptoms below). Systemic Candida overgrowth is also known as Candidiasis. Although there is a lot of controversy regarding Candidiasis in the medical world, it is increasingly recognised that there are serious strains or categories of Candidiasis which have become more common in recent years, along with the overuse of antibiotics, the rise of HIV/AIDS and increases in the use of invasive devices like catheters, valves and artificial joints, all of which increase susceptibility to Candida infection. Overgrowth of Candida has been identified as an epidemic amongst 90% of Americans and it is likely that similar statistics apply to many other countries. Candida is known to release over 79 different types of toxins into the system, resulting in the symptoms above. Overgrowth of Candida has also been linked to various illnesses like arthritis, prostatitis, ADHD, autism, Obsessive Compulsive Disorder, diabetes, "Leaky Gut" Syndrome, allergies, Psoriasis, asthma and many more. Treating Candida overgrowth and following a 'Candida Diet' to control the levels of Candida in the gut has been shown to result in significant improvement in many conditions including high blood pressure, hormonal imbalance, high cholesterol and diabetes. It is interesting to note that Candidiasis was almost unheard of before 1940 and that it is only since the use of antibiotics became widespread that it has become more and more common. The reason that the use of antibiotics can result in Candida overgrowth is because, along with the bacteria they are supposed to be killing, antibiotics also kill off the 'friendly' micro-organisms (probiotic flora) in the gut. As these micro-organisms are responsible for controlling Candida levels, reduced numbers of probiotic flora will result in an overgrowth of Candida. It is not easy to diagnose Candidiasis and many doctors do not even look for it when faced with a patient with the above symptoms. This is a problem because the symptoms of Candidiasis are also common to many other illnesses, which often leads to an incorrect diagnosis. The patient is then often treated with antibiotics which can make the problem worse. Untreated Candidiasis can lead to serious illness and damage to the intestinal wall and it is very important that it be correctly treated and the necessary dietary changes made. The best way of diagnosing Candida overgrowth is to have a stool sample analyzed. Usually a stool sample is collected at home and your doctor will send it away to a lab for analysis. Another way of determining whether Candida overgrowth is responsible for your symptoms is to cut out all sugars (including alcohol) and refined carbohydrates from your diet for a few weeks. If your symptoms begin to disappear, it is very likely that they were caused by Candida overgrowth. NOTE: Candidiasis can be a serious illness if not treated and you should always consult your health practitioner if you suspect that you have Candidiasis. There are fortunately a number of herbal remedies which have been shown to have a positive effect on intestinal health and functioning, as well as known anti-fungal properties. Feelgood Health has chosen the most effective of these and combined them in a unique therapeutic formula called Candidate, especially designed to treat Candida overgrowth, prevent topical Candida infections such as thrush and promote the growth of healthy probiotic flora in the digestive tract, thereby achieving lasting control of Candidiasis. "I have been up and down to so many doctors for recurring thrush infections. Each time I was successfully treated but each time it came back again. I also had a lot of wind and burping after my food which was very embarrassing and I used to become anxious whenever I had to eat in public. Only when I read your information did I realise that candida was the problem. Since I have taken a course of Candidate I have not been to the doctor once with thrush and I no longer burp the way I did. I can truly say that this product has changed my life!" 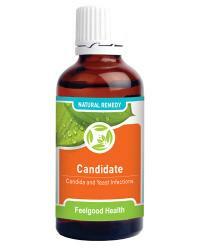 "Candidate has helped me a lot with a whole range of symptoms that I did not know were related to candida infection. I had the whole lot - depression, joint pain, gas, heartburn, itches in all the wrong place! When I read the symptoms I knew I had it bad so I took Candidate, Immunity Plus and also went on the Candida Diet for a month. I am eating normally now except for sugar and junk food and I feel like a young man again. I have started gardening again and can walk upright when I wake up in the morning which is a real miracle for me!" "I had all the symptoms you list but the main thing was overweight and I could NEVER stick to a diet. All I thought of all day was food and I could not resist anything with sugar in it. I used to feel guilty and worthless and weak, but now I know it was the candida craving the sugar as you explained. I have been taking Candidate for four weeks and I can stay away from the sugar for the first time in my life!!!!! I can't say THANK YOU enough! PS - why don't more doctors know about this!!!???" Dosage: Take 15 drops in appr. 1/4 glass water three times daily for 6 weeks. Follow up with a 3 week course about two or three times a year or whenever your symptoms begin to return. NB: Following the Candida Diet will help to keep symptoms away permanently. Candida loves sugar and starch! Also make sure to drink at least 8 glasses of water every day. Candidate gets to work immediately to eliminate Candida from the intestinal tract and to promote intestinal health, while eliminating toxins from the body. However, Candida is a very persistent organism and it may take some time, even months, before your system comes back into balance, depending on the severity of the problem. It is therefore important to be persistent and to follow a more complete Candida program. You can help Candidate to work faster by eliminating sugars, alcohol and refined carbohydrates from your diet and avoiding the use of oral antibiotics if possible. See below for more useful tips on how to beat Candida overgrowth. One bottle of Candidate will last approximately one month, representing real value for money! See our Special Offers below. Eliminate ALL sugars, alcohol and refined carbohydrates for one month. Thereafter keep these to a minimum. Drink at least 8 glasses of water a day to help flush out the toxins caused by Candida as well as the Candida itself. Avoid the use of antibiotics, antacids, anti-ulcer medications and steroids/cortisones if possible. Take probiotics containing Lactobacilli and Bifidobacterium, which help to control Candida levels. Eat plenty of plain yoghurt (no sugar). To treat topical fungal infections like athlete's foot and thrush, use a Tea Tree Oil preparation. There are various versions of the Candida diet available, but all follow the same basic formula. Feelgood Health has made it easier for you by creating an easy to follow list of what you should and what you shouldn't eat to beat Candida. Because we care, each time you place an order which includes Candidate, we will e-mail you a FREE copy of the Feelgood Health Candida Diet. The Candida Diet is not intended for weightloss, but is specifically designed to combat Candida, Candidiasis and yeast infections. However, if you are overweight, you will almost certainly lose weight if you follow the Candida Diet! Overgrowth of Candida causes intense cravings for sugar and starch, which is why many people cannot follow a weightloss diet. Controlling levels of Candida in your digestive tract will help you to stick to your weightloss plan, while eliminating sugar and refined carbohydrates will help you lose weight, while eating a healthy diet. Support for Systemic Candida overgrowth plus all round immune tonic! Internal oral drops to combat vaginal thrush plus internal candida remedy too!